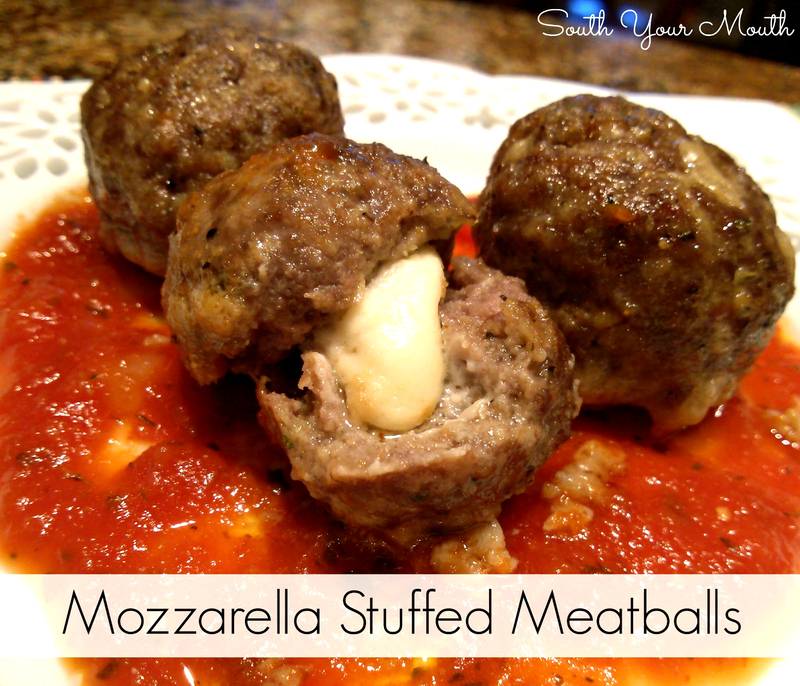 Easy mozzarella stuffed meatballs using individually-wrapped cheese sticks. Remember when I said all I had left in the freezer was ground beef and I thought I might lose my shiz if I had to cook one more meal with it? Well… guess what??? It’s still not Friday so I still haven’t gotten paid so we’re still eating ground beef. Determined to do something with it last night, I was staring into the fridge hoping inspiration would jump up and slap me in the face. We had these with spaghetti and pasta sauce but, honestly, I could have eaten these suckers with just about anything. The onions thought they were ahhh-mazing and liked biting in to them to watch the cheese string and ooze out. meatballs and ensures they’re all uniform in size. Add ground beef, eggs, Italian seasoning, salt, pepper, garlic and red pepper flakes to a medium bowl. Using your hands, mix ingredients together until just combined. Don’t “squeeze” the mixture with your hands – overworking the meat is what yields that “corky” texture. Add parmesan cheese and bread crumbs and continue to mix with your hands until all ingredients are just combined. Turn mixture out onto a cutting board or clean counter and shape into a rectangle. Pat her down good and keep working on it until it’s perfectly shaped. Using a sharp knife, cut the mixture into 24 squares. Line a baking sheet with aluminum foil (for easy clean-up) and spray with cooking spray; set aside. 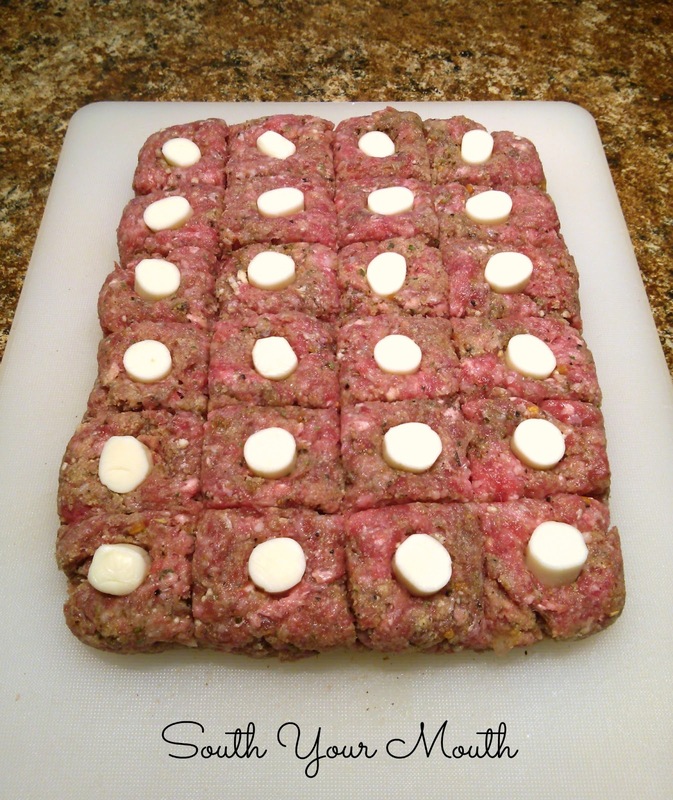 Cut each cheese stick into 8 pieces (24 pieces total) and press one into the center of each of the meatball “squares”. Roll each square into a tight ball. Place meatballs onto baking sheet and bake at 400 degrees for 15-18 minutes. Don’t overcook or the mozzarella might bubble out of the meatballs. yummo! these look so delish! love meatballs! never woulda thought to put cheese in them! now can you please come up with a version using ground chicken, pepper jack cheese & buffalo wing sauce!!! OMG I would be in heaven! pretty sure I am addicted to wing sauce! lol! love your blog! You two are geniuses, and I can't wait to try both versions! Mmmmmmmm, I love ground beef recipes, and I have a pound of ground chicken in the freezer just waiting for your magic, Mandy! What a great idea! This is now on my list of meal planning ideas for when my niece and nephew are with me for 6 weeks this summer. Thank you! Does anyone have any ideas on what to do with these other than a tomato sauce? =/ Im rather burnt out on tomato sauce at the moment. I'd think they'd be delish with a 4-cheese Alfredo Sauce too! how long does this take to cook in total? including prep! Turn them into sweedish on eggnoodles duh!